UK train operating company (TOC) Greater Anglia (GA) has revealed a mock-up of its new Aventra trains. As part of its winning bid for the East Anglia franchise, the TOC committed to the ambitious £1.4 billion programme of replacing its entire fleet of trains by buying 378 Stadler carriages and 665 Bombardier carriages. Earlier in the year GA gave an insight into how the Stadler Flirt trains will look and now, as it nears to the end of the design stage, it has revealed what to expect of the Bombardier Aventras. Capacity is key for the new trains and this is reflected in the design throughout. The saloon is not however a replica of what the Class 720 Aventras will look like because it brings together key features such as a toilet, dense seating and wheelchair spaces into one area. There is no first class section, a 3×2 seating formation has been adopted – though there will also be 2×2 seating – and there are a limited number of tables as seat-back tables are preferred because of a growing trend of tablet users. Instead of body-side heaters encroaching on leg room, under-floor heating has been used, seats are cantilevered too to save on space and there will be no doors separating vehicles. Free wi-fi will be available on-board, as will air conditioning and one accessible toilet on each train. Dual USB ports and a sole plug point will be available between seats. The design stage is expected to close in November 2017. The 665 Aventra carriages are due to enter service from 2019 forming 89 five-car and 22 ten-car configurations. The trains will run between London Liverpool Street and Essex, Hertfordshire, Cambridgeshire and Ipswich. They will serve key commuter towns along the West Anglia route, including Harlow, Hertford, Bishops Stortford and Cambridge, the Great Eastern Main Line, including Chelmsford, Witham, Braintree, Colchester, Clacton and Harwich, and the line to Southend Victoria. They will also supplement the Norwich to Liverpool Street Intercity service with a third train an hour between Norwich and London. Greater Anglia is a joint venture by Abellio, international arm of the state-owned Dutch national rail operator NS, and the Japanese firm Mitsui. So 3non Brit companies creaming money off for their own counties railways. The UK rail franchising model is a sick joke putting profits first and customers last! The most significant point in this article is the disclosure that the trains have under floor heating. I rented a flat in the 1960s, which had that form of hating and it gave you so much more space. The more I learn about these trains, the more I can understand why train operating companies are getting rid of their outdated stock designed in the last century. Much prefer the Bombardier Aventra Class 720’s than the Stadler Flirt Class 745’s and Class 755’s because of the doors on the Aventra are better and can reduce overcrowding whilst the Stadler Flirts which only has 1 door on both sides on each carriage is not enough to cope with overcrowding and will cause more problems with passengers shoving to get on and off the trains. I don’t like what Stadler are building the new trains for Greater Anglia. Sad to see that apparently a large number of seats do not have a window view. As a commuter on the Liv St-Cambridge line it’s really disappointing to see a revival in the Aventra of the 3×2 seating pattern that I thought would become a thing of the past when the ancient 317/1s (or however they are currently numbered) finally go out of service. Nobody wants to sit in that middle seat! Also, while it’s difficult to tell from the photo, are the 3×2 seats quite low (which they are in the 317/1s)? 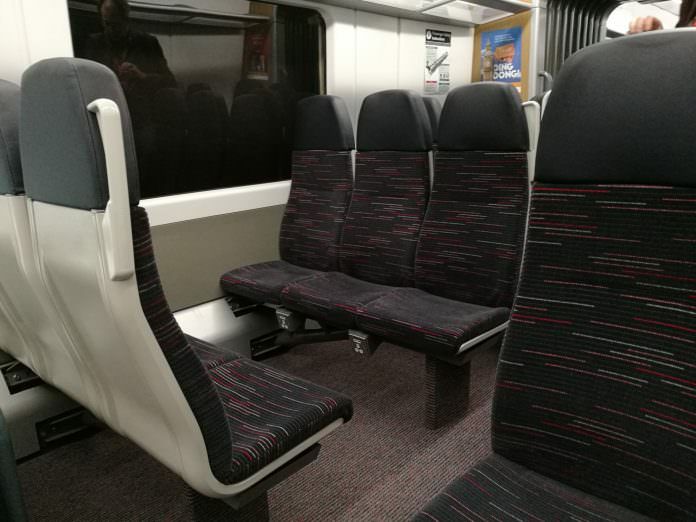 That’s a real design flaw for anyone with back problems or some other mobility issues – in the current 317/1s, there are a limited number of higher bench-type seats in the 2 end carriages of each 4-car set, but this doesn’t look like it will be a feature of the Aventra. Don’t be complaining about the 317s until you’ve experienced the refurbished 321s. They’re nice old trains (certainly not “ancient”), with proper seats and they still look smart. Looking at the new Aventra seats, they don’t appear a whole lot better. They’re still way too upright and seem very thinly-padded despite assurances to the contrary. I find the airline style configuration disconcerting – knowing that you have someone behind you without being able to see what they’re up to.